How is it possible to depth sort tiles and objects in an isometric environments without any limitations? I've been researching this for a while now and there seems to be no publicly available answers to this question. I've read lots on bubble sorting and other algorithms, but none of them seem to take this into account, or if they do, they don't document how. You can do it with a topological sort (usually) but even with just straight rectangular prisms you can still get cycles, so you have to watch out for that. But you may well be able to avoid that in your level design. http://en.wikipedia.org/wiki/Topological_sorting has two algorithms for doing a topological sort: I've used the depth-first one and just broken cycles by choosing the first one I encountered to be in front. So it won't crash or fail to complete if you have cycles, it will just look wonky. And you can easily report them if you're writing a map editor. totov, split scene on layers (sort scene by layers) and draw it layer by layer. Not the answer you're looking for? Browse other questions tagged 2d 3d mathematics algorithm isometric or ask your own question. How do I sort isometric sprites into the correct order? Most efficient 3d depth sorting for isometric 3d in AS3? 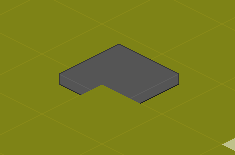 Tile based isometric depth sorting on different size objects. How do I find which isometric tiles are inside the cameras current view? Fastest way to render isometric world with moving entities?